Dragons are one of my favorite mythical creatures and I’ve had a fascination with them since I was a young child. 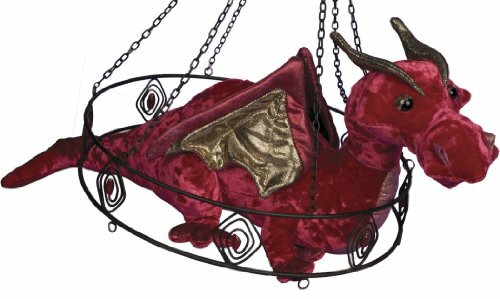 Just before Christmas, we did a post about home decor for dragon lovers so we thought it was about time to dig out the dragon hunting stuff again and show you a selection of wonderful Valentine’s Day gift ideas for dragon lovers. 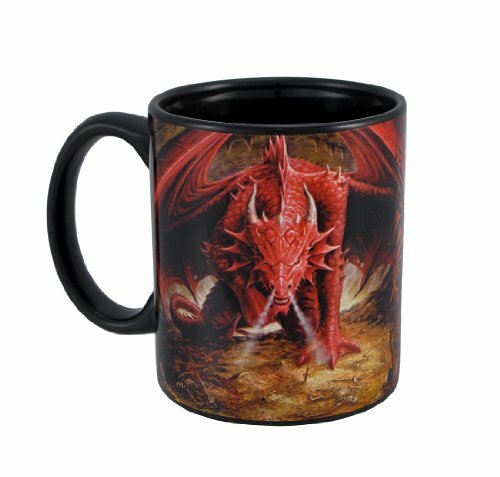 If your loved one is crazy about dragons, then one of these gorgeous Valentine’s Day cards from Zazzle would be a perfect card to accompany a dragon themed gift basket. 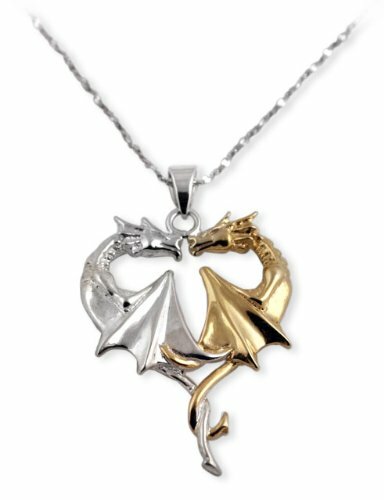 I love both the cute dragons but my favorite is the pair of entwined dragons. 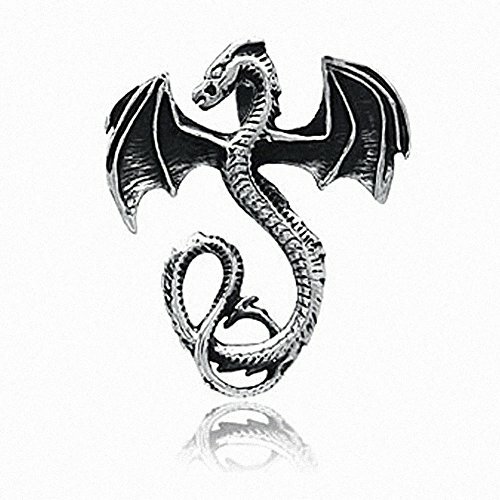 When it comes to jewelry for guys, a dragon motif makes a great subject. 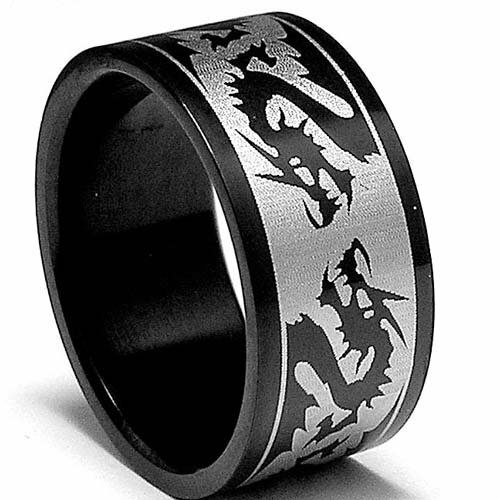 The dragon ring is a simple band but has dragons encircling it. It’s currently on sale for 87% off so that makes it a fantastic deal if you are looking for a ring for your fella. 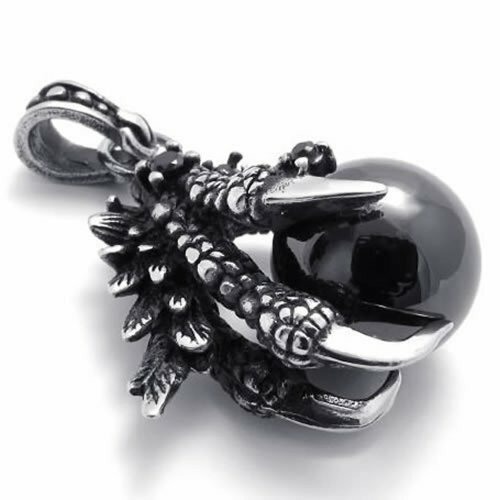 The dragon claw and ball pendant has a lot of fine detail and is chunky enough to be very masculine in style. 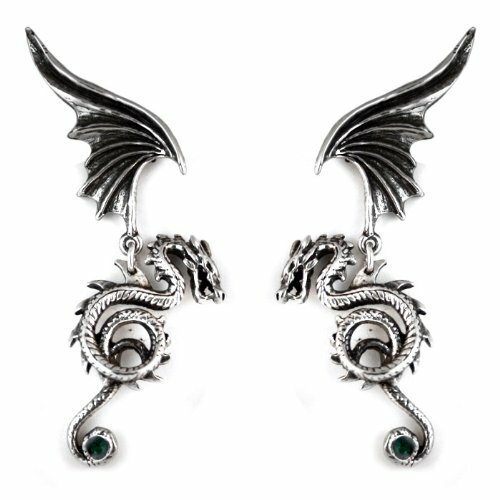 Buying jewelry for ladies who love dragons is much easier – there are loads of necklaces and earrings in particular so I’ve picked a few of my favorites. 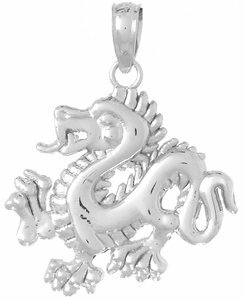 The white gold dragon pendant has the feel of an asian style dragon and is currently 45% off – it’s still an expensive item but the detail makes it stunning and definitely worth the price. 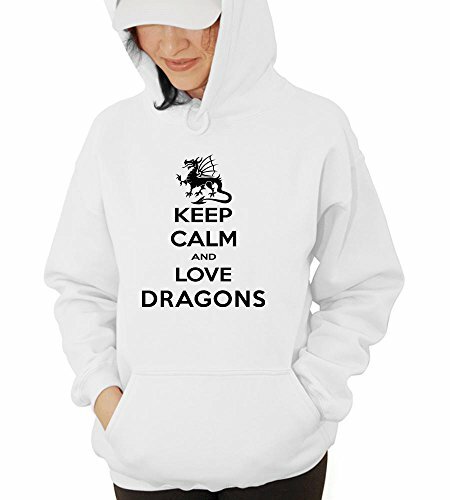 I particularly like the entwined dragons – as Valentine’s Day is all about love, I’d say entwined dragons are very symbolic and appropriate as a Valentine’s gift. If your relationship is quite new, it may be too early to be buying jewelry for each other so this next section is for cuddly toys or plushies. These are probably more suitable as a gift for a female – I don’t know many guys who have a collection of plushies after all! 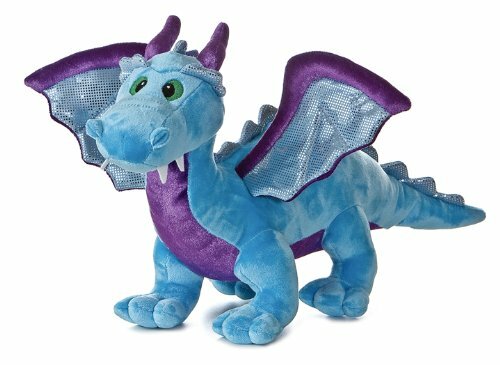 I love the bashful dragon – he’s just so cute and the color is fabulous. 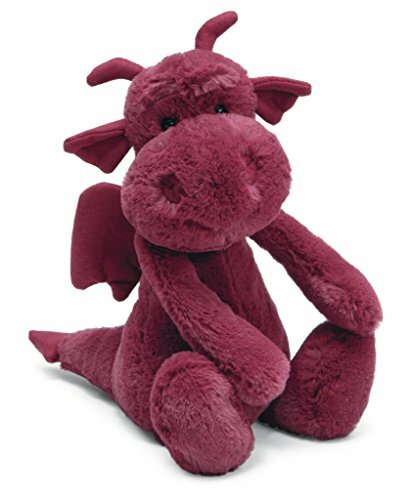 There are 100’s of dragon plushies available though – you can pick one to a color scheme for your gift basket or for your loved one’s bedroom decor perhaps. 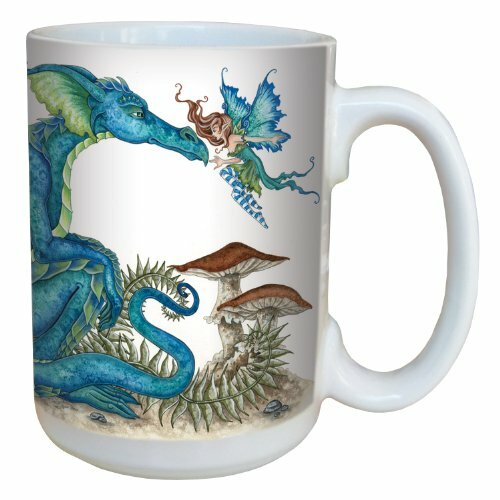 I think I’ve mentioned before that I have quite a few fancy mugs and this dragon and fairy mug will be joining my collection soon – I love the whimsical design. 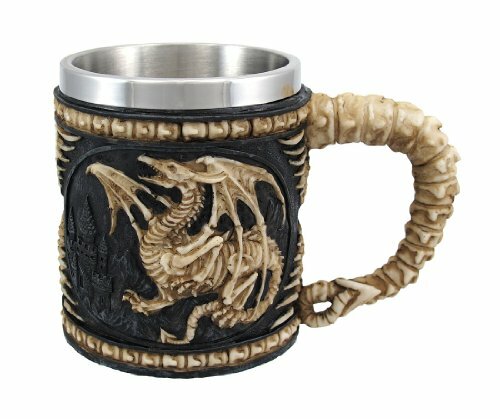 The dragon lair mug and the dragon skeleton mug would both be great budget gifts for a guy who loves dragons. The intricate design of the skeleton mug is amazing and is sure to be a talking point. 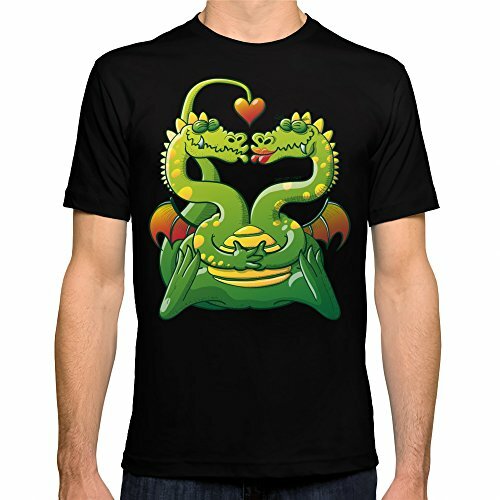 Lastly we have some wearable dragons – the t-shirt is a fun cartoon style pair of dragons in love – how perfect if both of you love dragons? 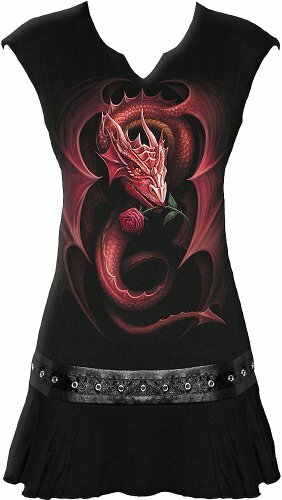 If your lady wears this style of clothing and wears mini-dresses, then this dragon & rose mini-dress with a studded dropped waistband might be something she would like. Don’t forget to sneakily check her dress size first though! The giving of themed gift baskets is a very American thing so being a Brit, I hope I’m getting it right with these posts! 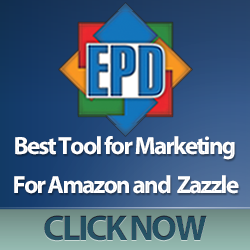 Set yourself a budget and pick gifts you know your Valentine will love – I’d add perfume or a box of chocolates for her and for him, perhaps add a small bottle of his favorite alcohol to round out the selection. We have loads of geeky and gaming themed Valentine’s Day gift ideas coming up over the next few weeks so if you have a geeky theme you’d like us to cover, feel free to leave a comment on our Gifts for Gamers and Geeks Facebook page.